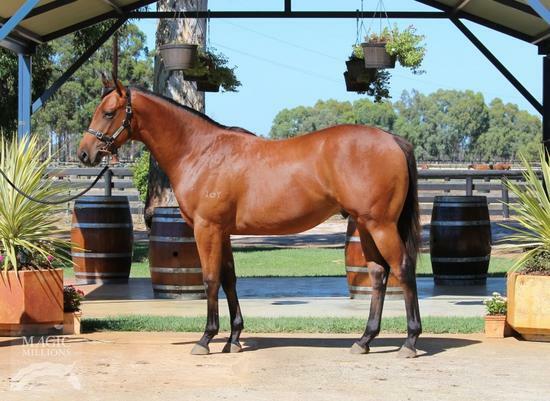 Check out our So Secret x Royal Culture colt, purchased as Lot 272 at the Magic Millions 2018 Perth Yearling Sale. Please Contact Us directly or call Steve Wolfe on mobile number 0409 905 327 for more information. SO SECRET (AUS) (Bay 2003-Stud 2009). 5 wins to 1200m, A$305,475, WATC Colonel Reeves S., Gr.3. Sire of 109 rnrs, 59 wnrs, inc. SW Hobart Jones (WATC Karrakatta P., Gr.2), Wacked Out, Couleur Bizarre, SP Keysbrook and of Lucky Roar, Three Secrets, Flying Roar, Iz That Right, Watto's Fury, Bushfire Blonde, The Anaesthetist, Dutch Spy, Rocket Queen, Baraki Beats, Little Gracie, Rattlehead, Secret Assault, Secret Minx, Secret Nova, etc. Cool Culture (f. by Henny Hughes). Winner at 1200m in 2017-18 in Aust. Royal Culture. 2 wins. See above. CARGO CULT (Spectrum). 6 wins-1 at 2-to 1400m, A$555,650, MRC John Dillon S., L, VRC Emirates Airline Welter H., MVRC Winning Edge Presentations H., VRC Rails Car Park H., Bendigo JC Richmond Sinnott & Delahunty H., 2d MRC Futurity S., Gr.1, SAJC Goodwood H., Gr.1, MVRC Waterford Crystal Mile H., Gr.2, MRC Kevin Heffernan S., L, VRC Flemington Drive H., MRC Members' Race Day 2YO H., MVRC Cox Plate Booking H., Bensons Property Group Liquica P.H., 3d MVRC Ian McEwen Trophy, Gr.3, MRC Sandown S., Gr.3, 4th VRC Bobbie Lewis H., Gr.3, Chester Manifold S., L, MRC Sir John Monash S., L.
Gower. 5 wins at 1200m, 1300m, A$145,235, MVRC Tour of Victoria Sprint Final H., MRC (Mornington) Fibretrack H.
CULT FIGURE (Ahonoora). 2 wins. See above. IMMORTALITY (Lion Hunter). 8 wins to 1200m, A$285,675, VRC Bob Hoysted H., L, MRC Redelva H., SAJC Distinctive Lifestyle H., Distinctive Homes H., One Solution H., Star Cruises H., Parmalat H., 2d VRC Kensington S., L, MRC Turf Ruler H., SAJC Adelaide Bank H., 3d MRC CFV Partnership P., VRC Colorbond Steel Sprint H., SAJC Sportingbet H., Adelaide Galvanising Boxing Day H., MRC Palphar H.
GEEGEES CLASSICBOY (Wordsmith). 4 wins from 1350m to 2200m, A$109,550, to 2016-17, Tasmanian Derby, L, TRC Cambridge Moto P., Devonport RC Simons Design Centre H., 2d Devonport RC Sheffield Cup, TTC Helloworld Launceston H., Devonport RC Register 4 Research H., 3d Devonport RC Goracingtasmania.com.au H.
CHOICE BRO (Choisir). Joint Head of the 2011-12 NZ 2YO Free H. 8 wins-3 at 2-from 800m to 1600m, NZ$324,975, A$304,850, to 2017-18, Manawatu Sires' Produce S., Gr.1, Taranaki 2YO Classic, Gr.3, ARC Karaka Mile, RL, Toowoomba TC Weetwood H., L, Tattersall's Racing Club H., Marton JC Rural Fuel H., 2d BRC Strawberry Road H., L, Manawatu RC New Zealand Bloodstock 2YO H., BRC Canadian Club H., Chris Anderson Racing H., 3d ATC Bill Ritchie H., Gr.3, BRC Hampden S., L, Spear Chief H., L, Toowoomba TC Weetwood H., L, BRC Twilight Race Day H., Bluescope H., Hog's We'd Love to Meat You H., Rockhampton Cup, ATC TAB Rewards H., BRC Cargo Transport Systems H., 4th ARC Avondale Guineas, Gr.2, Karaka Million, RL.